Donovan Mitchell seemed like a steal for the Utah Jazz in last years draft. Mitchell was taken with the 13th pick in the 2017 draft by Denver, but then was immediately traded to Utah for the then 24th pick Tyler Lydon & Trey Lyles. 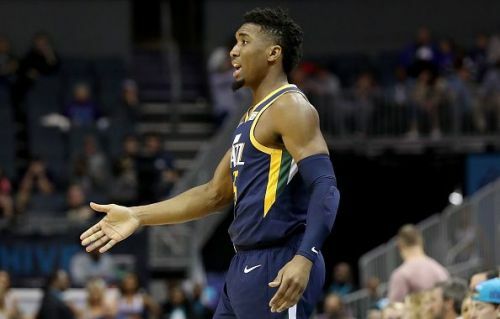 Mitchell seemed like the explosive piece that Utah had been missing after the exit of Gordon Hayward, and the perfect compliment to their existing solid team of Rudy Gobert, Joe Ingles & Ricky Rubio. Last season Mitchell ended a Rookie of the Year finalist, helped the Jazz reach the Western Conference semi-finals (losing 4-1 to the Houston Rockets), and finishing the season averaging 20.5 PTS. This season has been disappointing for both Mitchell and the Jazz. Donovan has seemed to have plateaued with his form. His 3pt % is only at 30% this season, which is down from 34% season, and the explosiveness has not been at the same level. The Jazz as a whole seem to be flat this season, currently sitting 13th in the Western Conference, way below where they were predicted to be. Mitchell is the core of this team, and his form needs to pick up. For Mitchell to truly become an elite level player, his assists need to come up - he is only averaging 3.3 AST per game, which is too low for a guard in today's NBA. Whether the addition of Kyle Korver will help relieve some of the Jazz' shooting woes, giving Mitchell more space to run the floor and cut through the lines, but his explosiveness that made him stand out last season just has not been as consistent as last season. His points are still at the same level, currently averaging 20.8 PTS, but the rest of his game needs to develop to in order for him to jump up to the next level.